Now Available! Free Shipping for Glowforge Pro & Plus ordered today. Make magical things at the push of a button. Learn which model is right for you. What can you print with Glowforge? Built on laser cutter/engraver technology. Glowforge uses a beam of light the width of a human hair to cut, engrave, and shape designs from a variety of materials. Thousands of customers are discovering what's possible. Use Glowforge to customize existing products or create something entirely new. 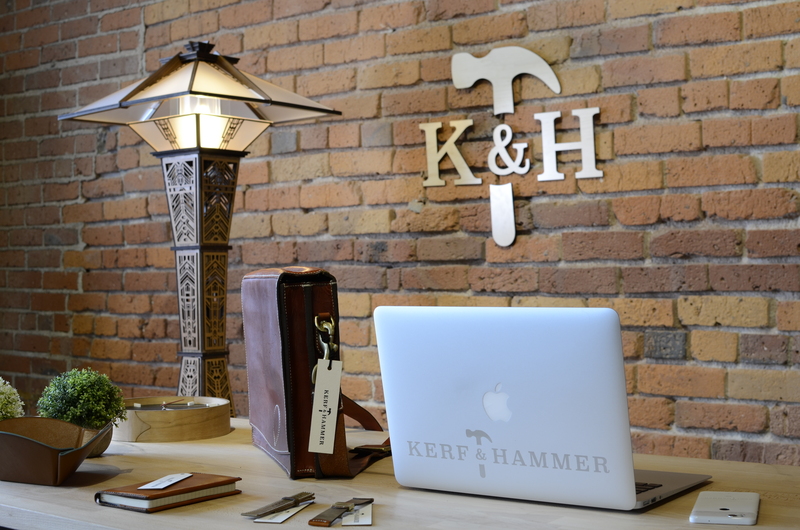 See how owners are turning creativity and passion into successful businesses in no time. The revolutionary features that set Glowforge apart. See your design take shape before you print. Onboard cameras show you a preview of your design on whatever material you choose. Place your design with your mouse or finger and position it exactly where you want. Just like a camera, your Glowforge has a fully automatic focusing system to cut and engrave on materials both thick and thin. Before each print, the height is measured with exacting precision to be sure it prints perfectly, every time. Engrave complex, three dimensional curves with 1,000 DPI resolution. To get perfect detail and sculpt with real depth, Glowforge can carve away material with multiple passes for truly detailed and impressive results. The hardest part of setting up is deciding what to print first. Your Glowforge uses Wi-Fi and a regular outlet, and tutorials make the first prints a snap. Put your Glowforge near a window with the included exhaust hose or add a Glowforge Air Filter to print anywhere. 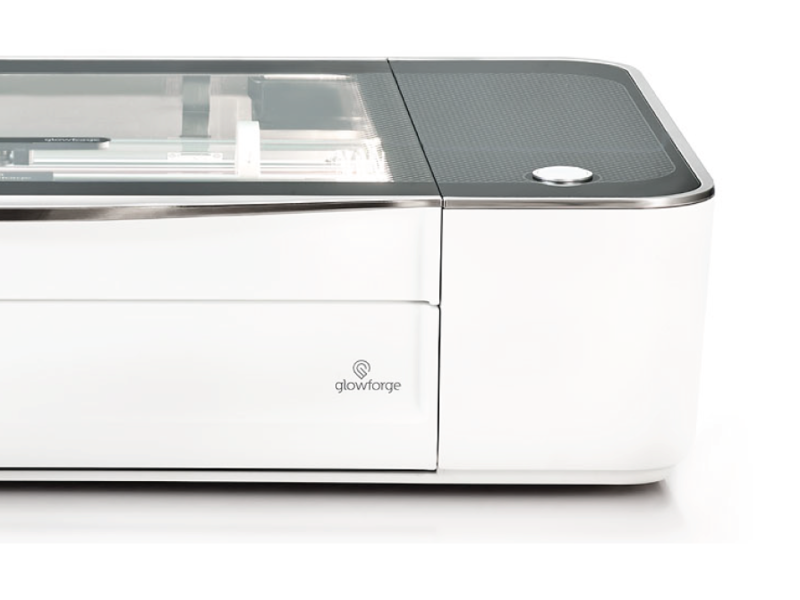 Under FDA regulations, the Glowforge Basic and Glowforge Plus are categorized as Class 1 lasers, like a DVD player, so no special precautions are required to use them. The Pro model is a Class 4 device like other lasers, and requires additional precautions. Your Glowforge motors can control motion to a thousandth of an inch, and the laser can focus down to the width of a human hair. Combined, they can create prints with exquisite detail and precision. Just use a pen to draw directly onto your materials, and watch your designs transform. From a doodle to a masterpiece, onboard cameras scan and turn your drawing into a real product. Resize, copy, or personalize it further – you’re just one button away from a beautiful print. 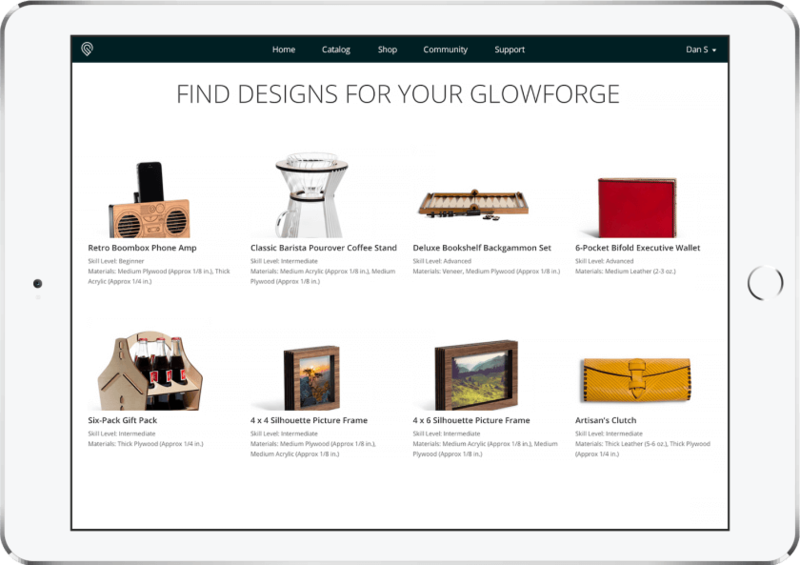 When you don’t want to start from scratch, browse, buy, and print from the Glowforge catalog. Choose from dozens of ready-to-print designs that you can personalize, like jewelry, the perfect shoulder bag, or fun wall art. No design experience needed. Use the format and system that’s best for you. You can work from your Mac, iPad, iPhone, Android, and Windows or Linux computer. Design with Inkscape, Adobe Photoshop and Illustrator, GIMP, Fusion 360, Corel Draw, and more – even PowerPoint or Google Docs! Compatible with JPG, PDF, PNG, and SVG. Your Glowforge runs from a web browser, which means there’s no software to install - ever. Drag and drop your designs right onto your material. Upgrades are instant and seamless. Whether you use a thick natural leather or beautiful maple, Proofgrade™ brand materials are automatically recognized by your device. Material settings are instantly configured so you can focus on what matters: your project. The unique Compact Filter eliminates the need for outside ventilation. It sits on the ground near your Glowforge and cleans the air coming out of your Glowforge, allowing you to operate it anywhere in your home, school, or office! Alternately, you can use your Glowforge near a window with the included duct. Catalog designs are the perfect gift. Print jewelry, toys, leather goods, lighting, containers, art, and more. Designs are extensively tested and guaranteed to print perfectly every time. Each comes with detailed photo instructions to make them a snap to finish.